After one failed attempt, the day finally arrived…I would donate my life juice to the benefit of those in need! Well, that may be a little dramatic…I went to donate blood at a local temple were the Red Cross had set up. From the second I walked in this set-up was much more promising than my last try. There were more donation booths, more nurses, and a quicker check-in process. 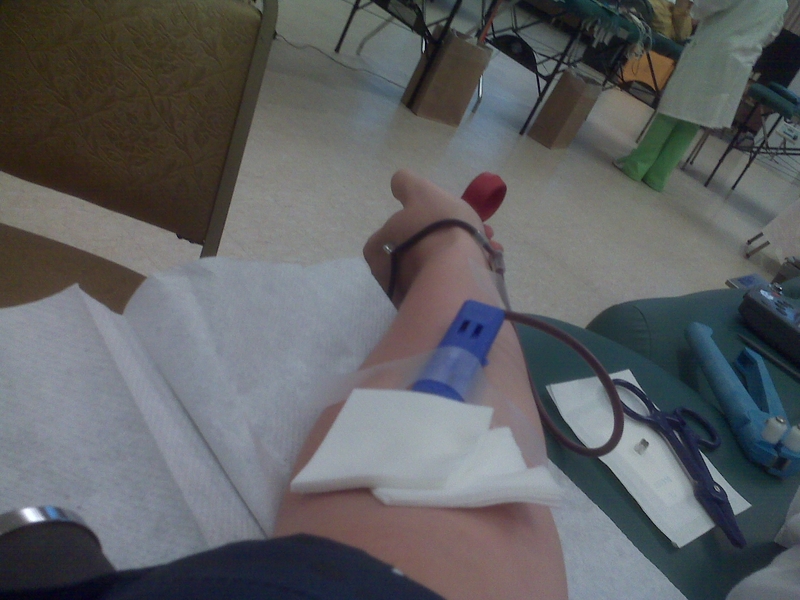 Donating blood for the first time since I was 16! I gave the desk my name, signed the waiver and went to the waiting area. It was a meat locker in their! It must have been 50 degrees at the most, but that was fine because I only waited about 4 minutes. Not even enough time to tweet that I was giving blood! So they called my name and I went to the screening area. The nurse took down all of my vitals and information, and then handed me the computer to answer all of the screening questions. The only question that slipped me up was about having been to an African country. Well, I was born in South Africa, so yes, I have been there, and I am not about to lie to the Red Cross. When the screening nurse came back, she was purplexed by the situation. I would not really think that having some one born in Africa is all that unusual, but I digress. She quickly made a note that I was not “at risk” and we were off to the blood donation beds! Note to readers: Do NOT wear a skirt to donate blood. You will be lying on a table, and there will be a creepy person lying across from you enjoying the fact that you wore a skirt! However, the nurse sensed my intrepidation and produced an extra bed cover for a little extra coverage! Thank you nurse! Apparently I am allergic to iodine, and there are signs all over the center stating to make sure the nurse knows if you are allergic to iodine or latex. I must have told the nurse 8 different times, each time fearing I wouldn’t be able to complete #31. But never fear allergics out there, they just use an alternate prep method to get you ready. I can not discribe the next part of the process to you, because my head was firmly turned in the opposite direction in the hopes that the “ostrich” method works with needles too. If I don’t see it, it can’t hurt, right? Well it wasn’t so bad. A minor uncomfort as the needle went in. There were a few more minor uncomforts during the times I squeezed the stress ball to make my blood flow faster (every 5 – 10 seconds is suggested), but nothing that would keep me from donating again. About 3 minutes in, all of the nurses came over to marvel at how quickly my blood was pouring out, apparently I am the fastest blood donar this side of the Mississippi! Do I get a badge for that? No, but I do get to see the horrified look on the nurse’s face when my blood doesn’t stop flowing after the needle is removed! Never fear, it went from gushing to completely stopped in about a minute. When I was done, I am happy to report I did not pass out like the time in the Doctor’s office. I sat up slowly, took my juice and cookies, and headed to the car…only to be followed by a running nurse screaming at me that I can’t leave right away and have to sit for at least 15 minutes…oops. The other donars at the “post-op” snack table made a snyde comment about me being young and thinking I don’t need recovery time. Whatever, it just means a second pack of Oreos! 6 weeks after donating blood, new donars receive an ID card in the mail stating their blood type (A-) and containing a bar code for quick check in on future donations. Did you know that only 30% of donars return to give blood again? I am not sure why. It saves lives and only takes an hour (at the most) out of your day. I can give blood again come September, and I fully intend to do so. I remember my mom giving blood as much as she could when we were little, and thinking I couldn’t wait to grow up and be able to do that much good with that little effort. This entry was posted in 101 Blog, Uncategorized and tagged 101 in 1001, blood type, day zero, Donate blood, donation, first time doner, good deed, needle, Red Cross, volunteer by reneeh. Bookmark the permalink. or a free meal etc. I agree, it is such a small thing to do to save somebody’s life. Thanks Tara! I love to hear from my FSU GPBs! It brings back so many great memories every time I see one of your names! Mwah!